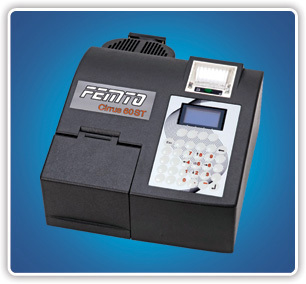 Cirrus 60 ST SPECTROPHOTOMETER - Double beam, Ultra micro volume! It means green chemistry! Lower volume of waste! SUSTAINABILITY! It means reduction of sample volume and reagents and lower cost of waste material treatment. It means green chemistry! Measurements of sample and reference simultaneously allow your work started with high stability immediately after to connect the analyzer. VIS 325 to 1100 nm Spectrophotometer, double beam with sample and reference cells simultaneously, with attached printer. Measurements of kinetics of enzymes, involving reduced sample and substrate volumes, 50 µL for 10 mm path length. Multi wavelength: Abs ratio, Abs difference with 2 or 3 wavelength. Standard curve: simple linear regression, polynomial equation of third degree.